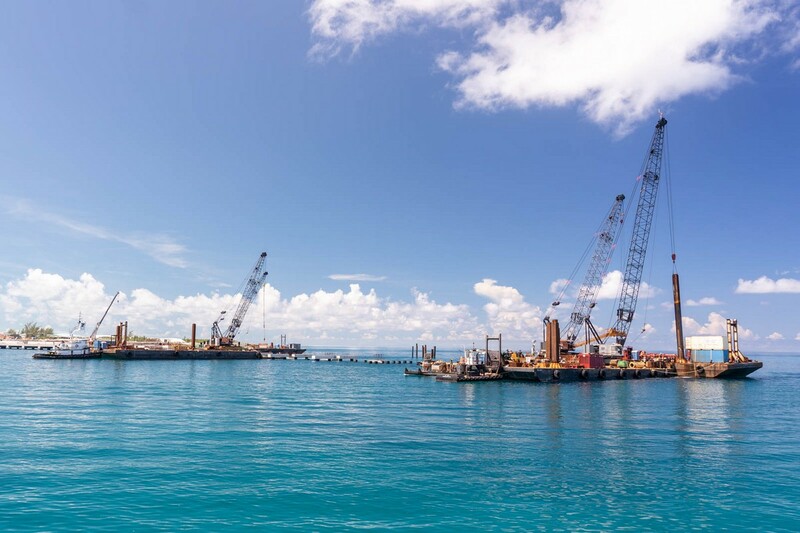 Royal Caribbean held a call with investors to go over their record 2018 financial results and provide guidance for the coming year. 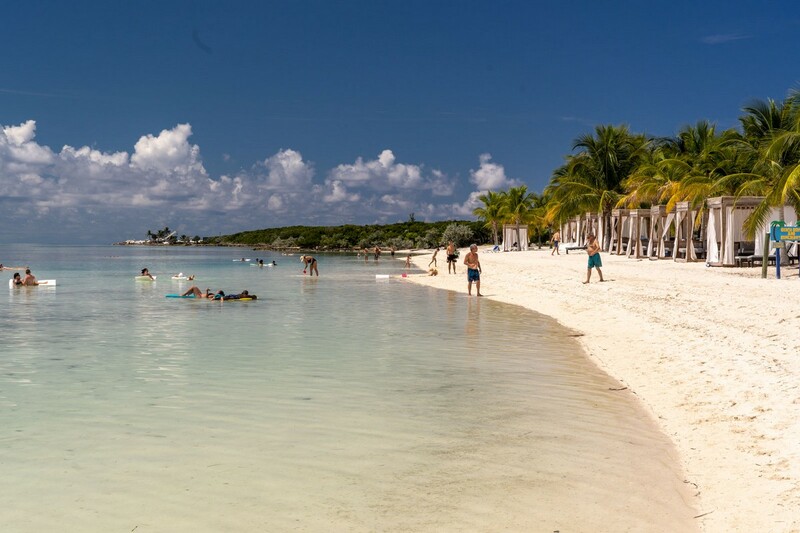 Royal Caribbean Cruises Ltd earnings beat Wall Street expectations, benefiting from higher demand for its Caribbean cruises and passengers spending more money on activities while on board. 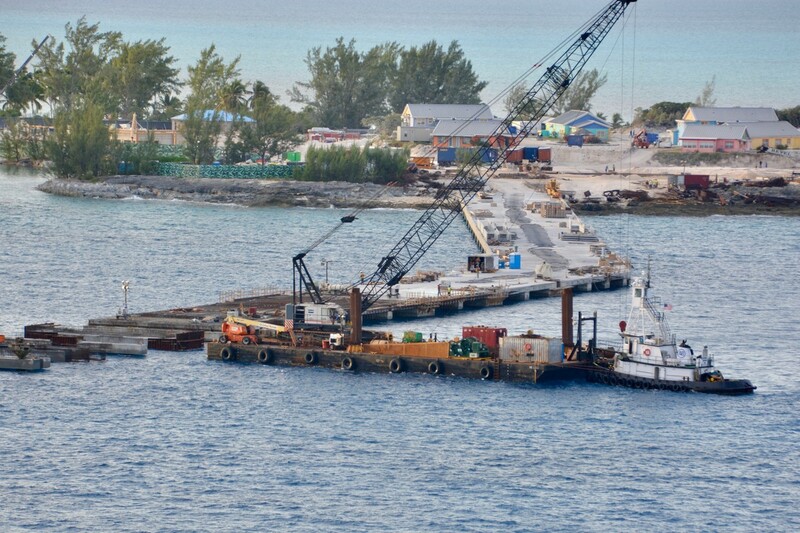 Between the fiscal anecdotes and figures shared, cruise fans could glean a few tidbits of interesting information. 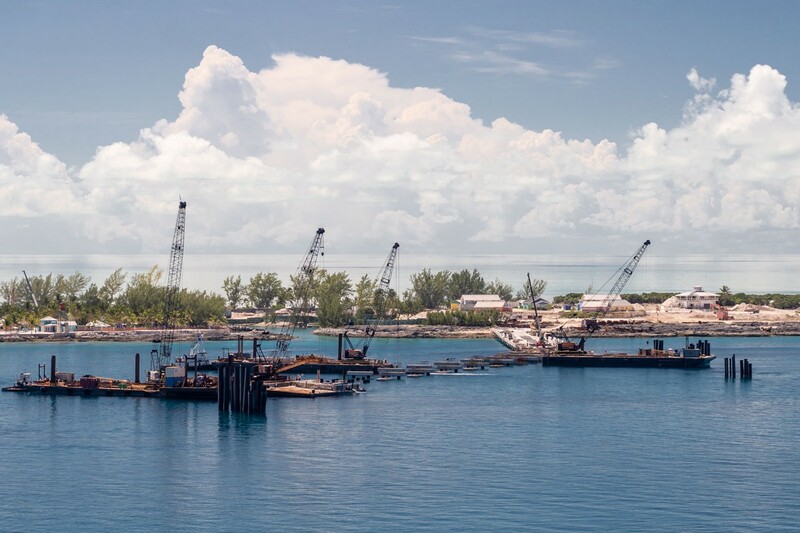 At the beginning of the call, Royal Caribbean Cruises Ltd. Chairman and CEO Richard Fain started off that two powerful trends are dominating bookings for Royal Caribbean: experiences over material possessions and favorable demographic shifts. Mr. Fain spoke about what he is seeing in the market, "As we have been very vocal about two important and positive consumer trends. First, the trend in favor of experiences over material possessions, and second, the favorable demographic shifts. We've been talking for a long time about how people have shifted their focus from buying TVs, cars, etc to buying memories or experiences. And that shift has become so powerful that I think it's now obvious to everybody. At the same time, the demographic makeup of our population keeps shifting in our direction. 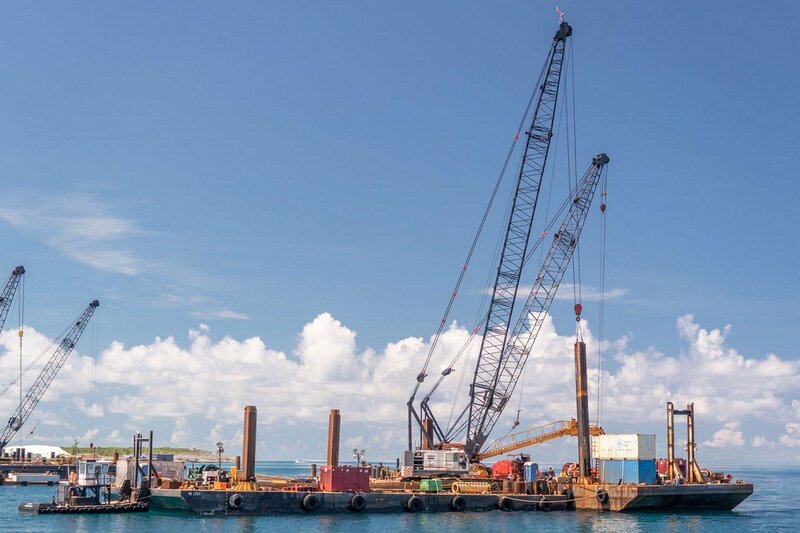 These two trends have become increasingly powerful, and our company and our brands are well-positioned to benefit from these trends." 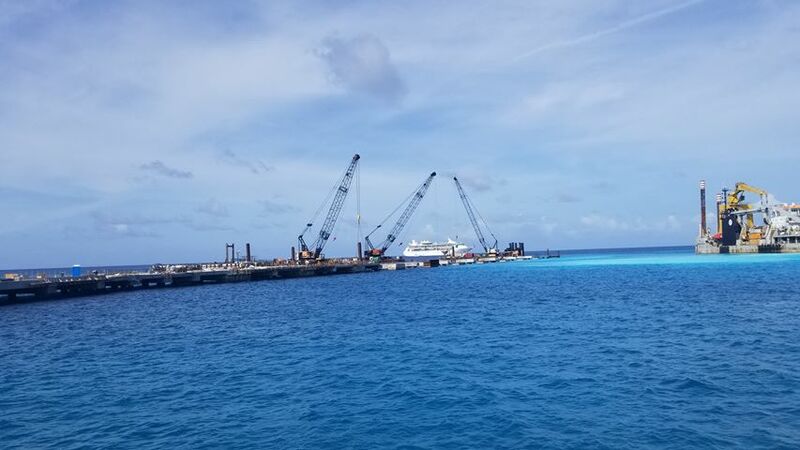 For those unaware, Wave season is the sales period that has historically taken place between January and March and stands out because a large percentage of cruisers book their sailings in the early months of the year. 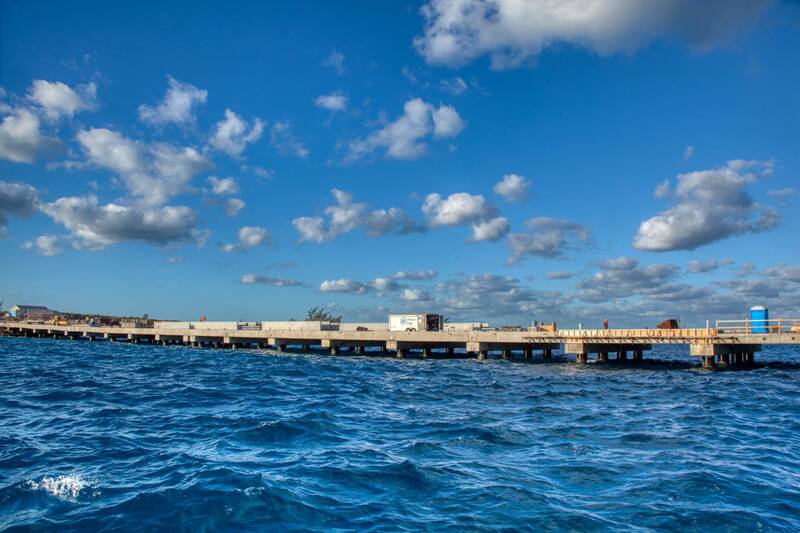 This year, Royal Caribbean has seen a record Wave season take place. 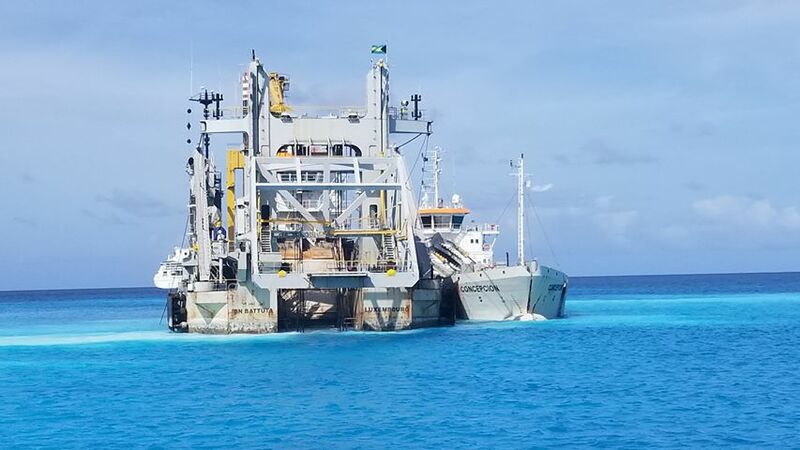 Richard Fain mentioned it at the top of the call, "Happily, the record-breaking start to Wave validates our confidence. And with Wave off to a wonderful start, our already good booked position continues to strengthen. 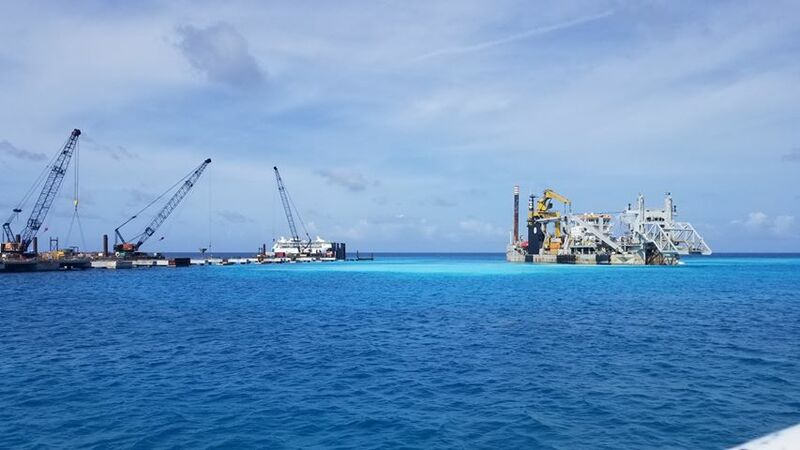 Bookings have been at higher levels than last year, and in fact we received more bookings during the first week of Wave than we have in any other week in our history...except for the second week in Wave, which was even better." 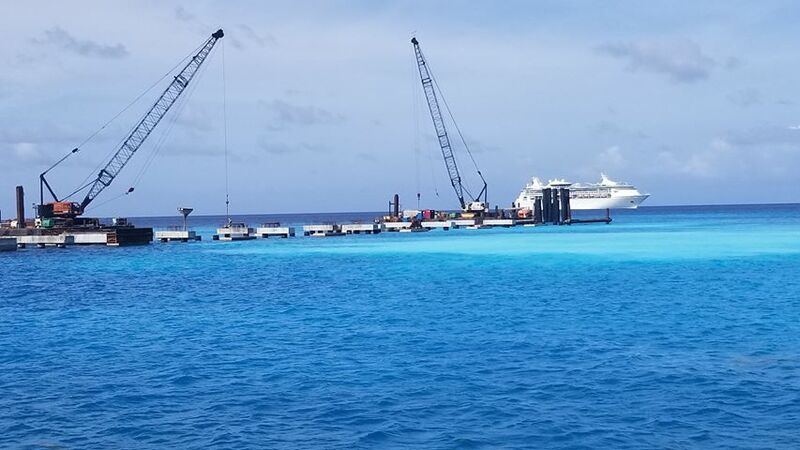 Royal Caribbean Chief Financial Officer Jason Liberty also touched on the great start to the year, "Over the past three months, bookings have been higher than the same time last year.... In fact, two out of the past three weeks have been record-booking weeks for the company." 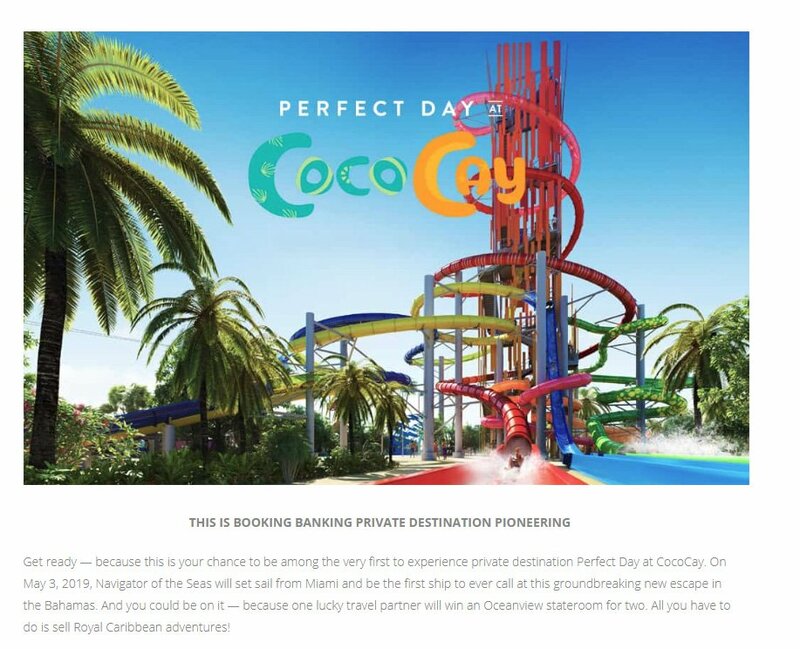 With the launch of Perfect Day at CocoCay coming up in just a few months, Royal Caribbean sounded quite bullish on the impact it is already having and will have on the cruise line's bottom line. 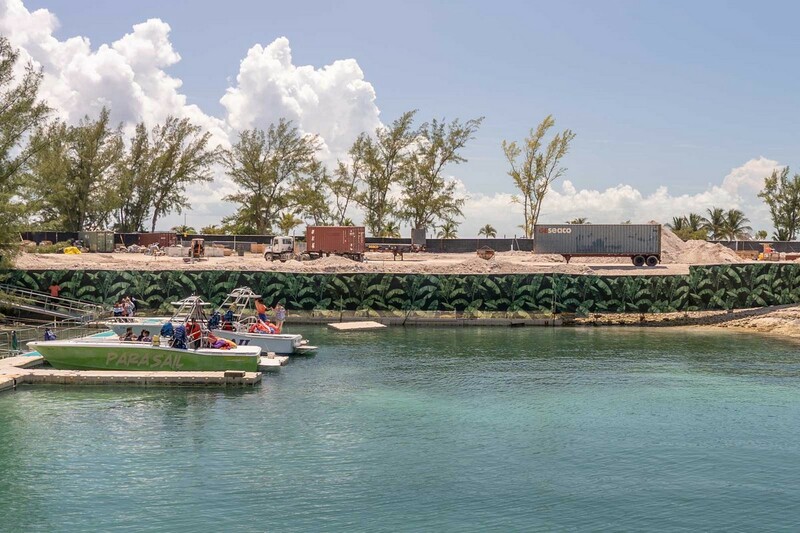 Richard Fain commented on the impact Perfect Day at CocoCay will have on the cruise industry, "The island development will really shake-up the short-term cruise market, and I am confident that our guests will love it." Royal Caribbean International President and CEO Michael Bayley also had some interesting facts to share about Perfect Day, "When you look at Royal Caribbean International, we have I think 13 ships operating in the Caribbean during the year, and then when you look at the deployment of those ships to Perfect Day in 2019, I believe ten out of the thirteen ships are calling to Perfect Day. 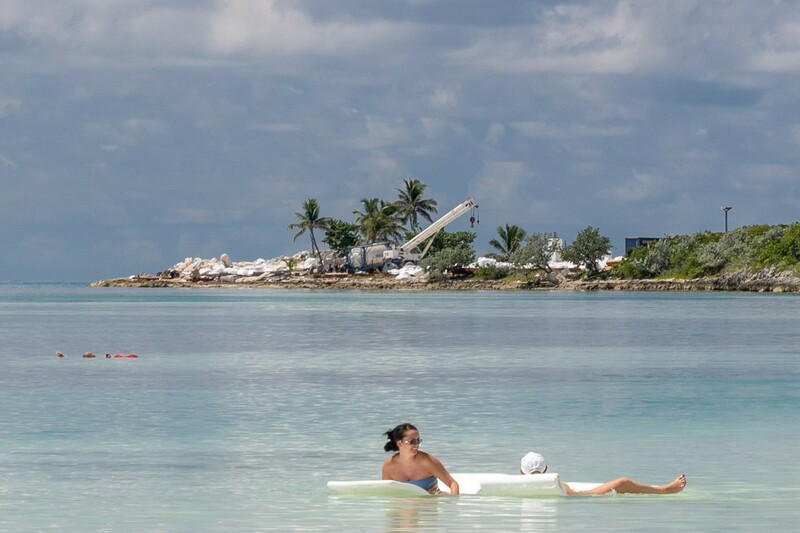 Our projections are that by 2020, we will be taking just shy of two million guests a year to Perfect Day. 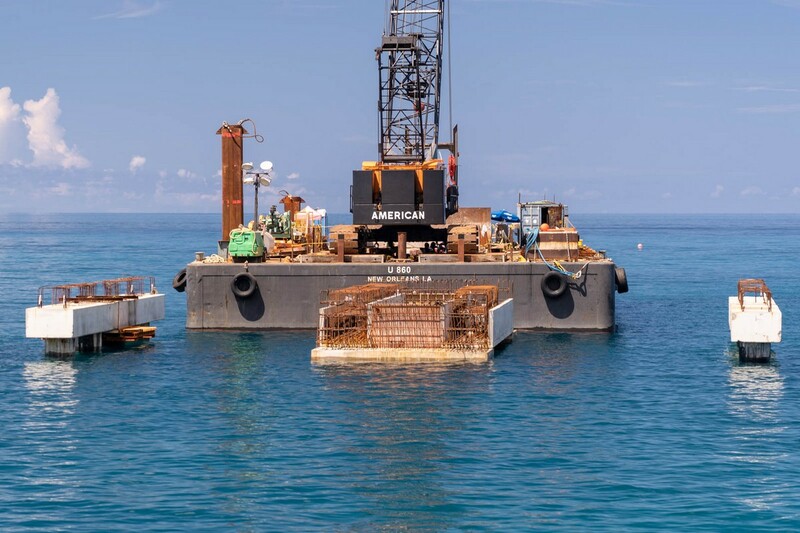 And then of course the other element is the sales associated with the experience of Perfect Day, and we've seen our sales of activities and experiences really take off on our pre-cruise sales for the experience, so we're up by a factor of close to nine, I think, for our Perfect Day sales." 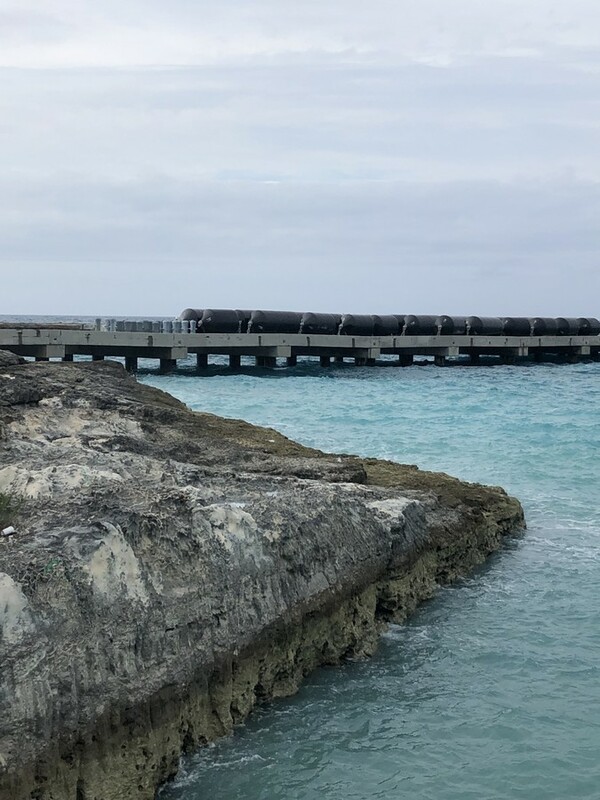 Naturally investors want to hear that a company's investment in a piece of technology or a new initiative is driving home a return and Royal Caribbean is happy to report that despite its major tech initiative, code named Project Excalibur, has not fully launched yet, already the cruise line is reaping some benefits. 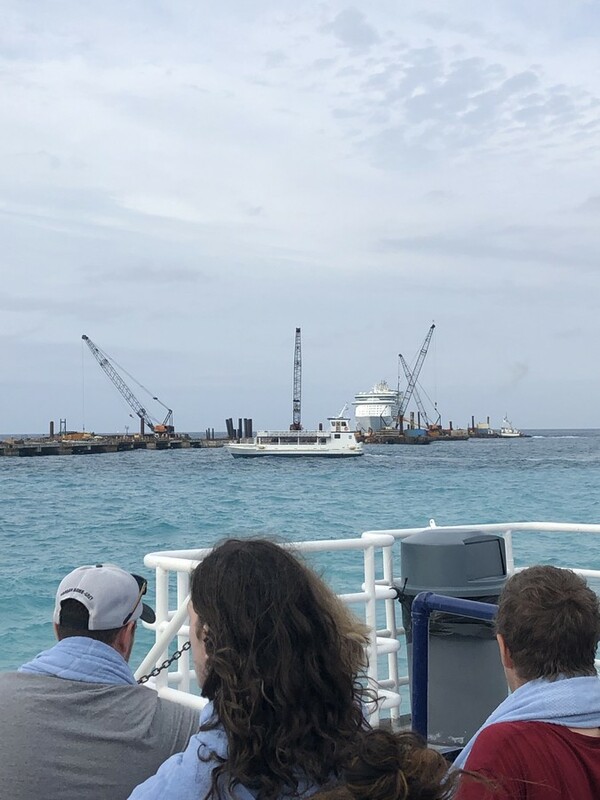 Mr. Liberty explained that essentially, the cruise line is seeing guest satisfaction rising quickly because the app and other tech advances remove friction from the guest experience. 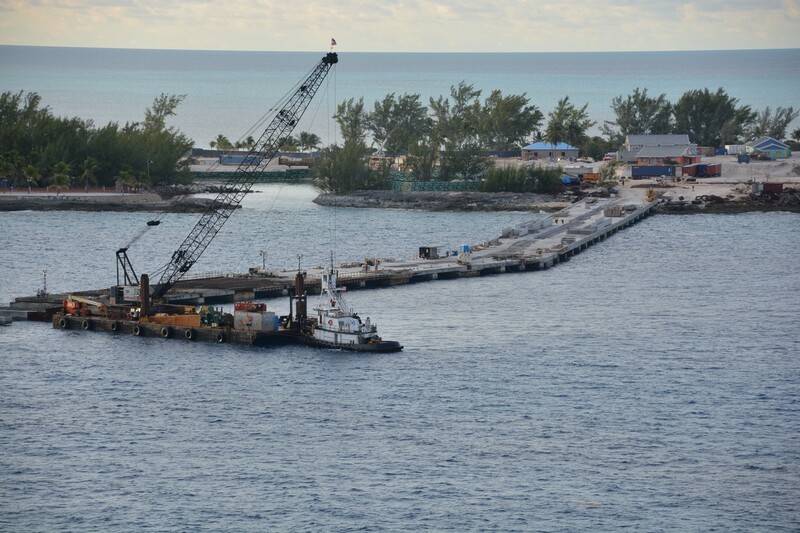 That in turn provides higher yields for Royal Caribbean. 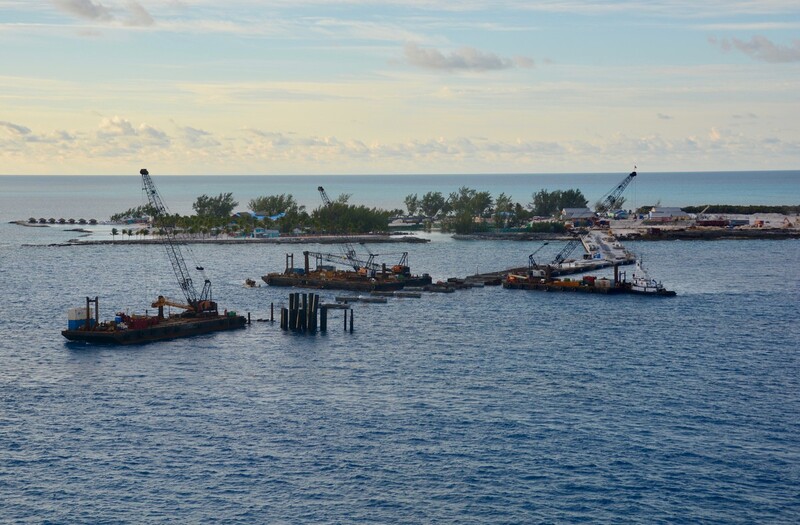 In the future that will make it easier for the consumer to buy things from the cruise line. 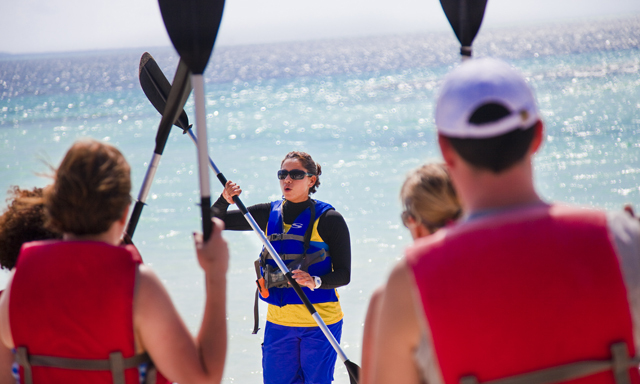 "There is a strong relationship to where guest satisfaction scores go up, and people pay more both for their ticket as well as onboard. 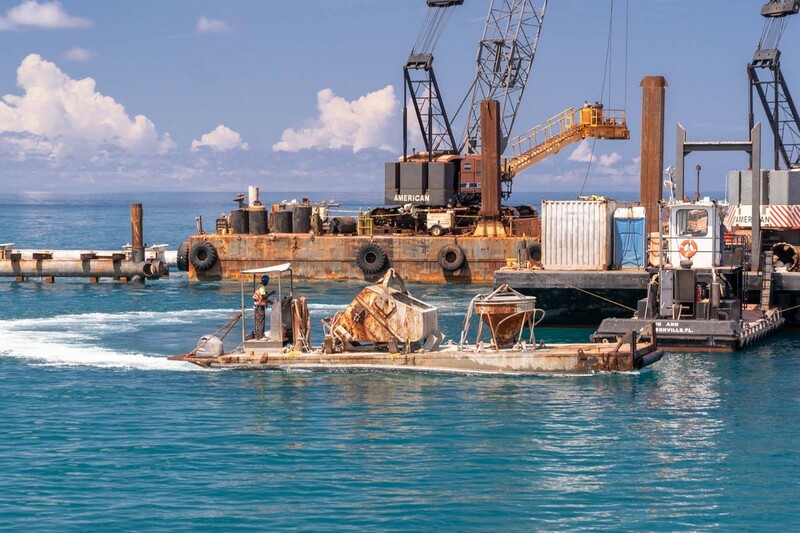 Certainly ships that we have put Excalibur on we are seeing those benefits." 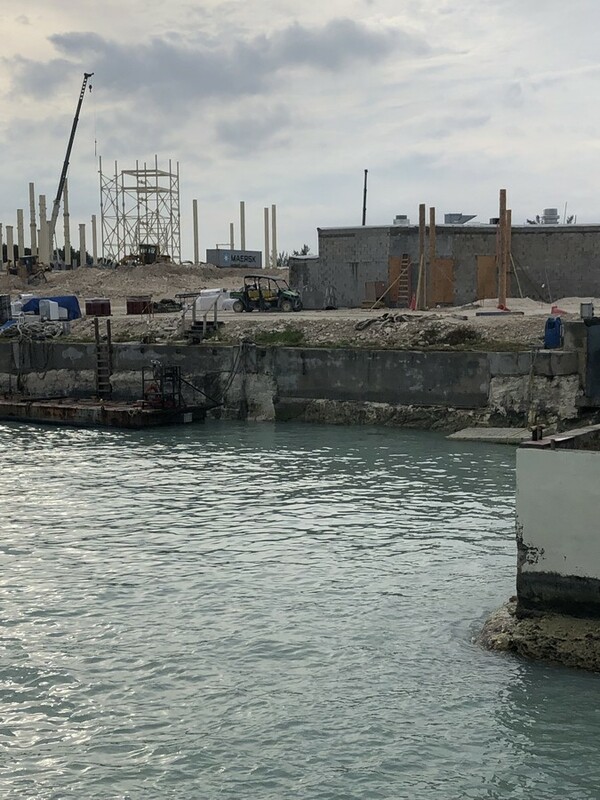 Royal Caribbean Blog reader Kayla Hildebrandt recently visited the island and shared these photos of the progress being made. 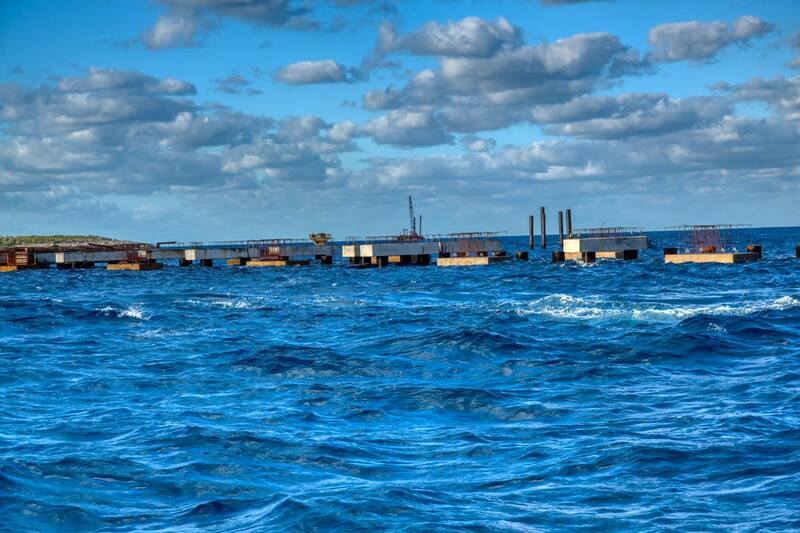 In addition, Caran Popowitz shared these photos from her recent trip to CocoCay. 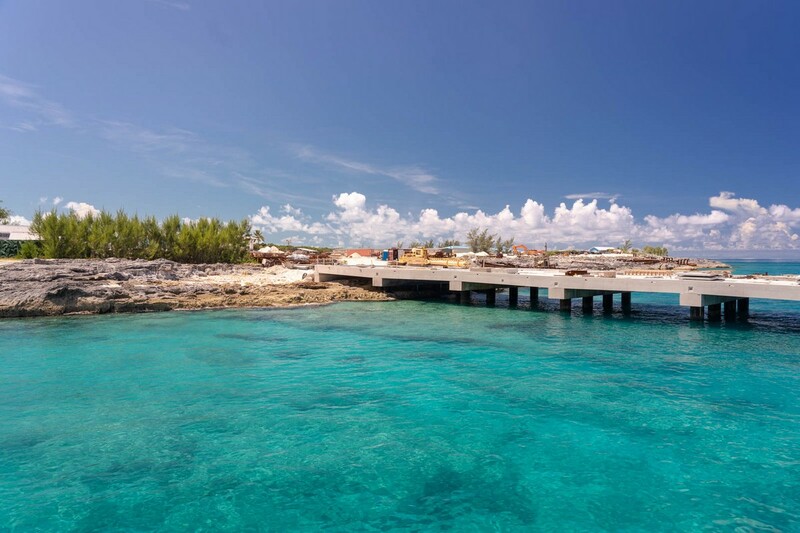 Royal Caribbean currently estimates the pier for its private island to open in March 2019. 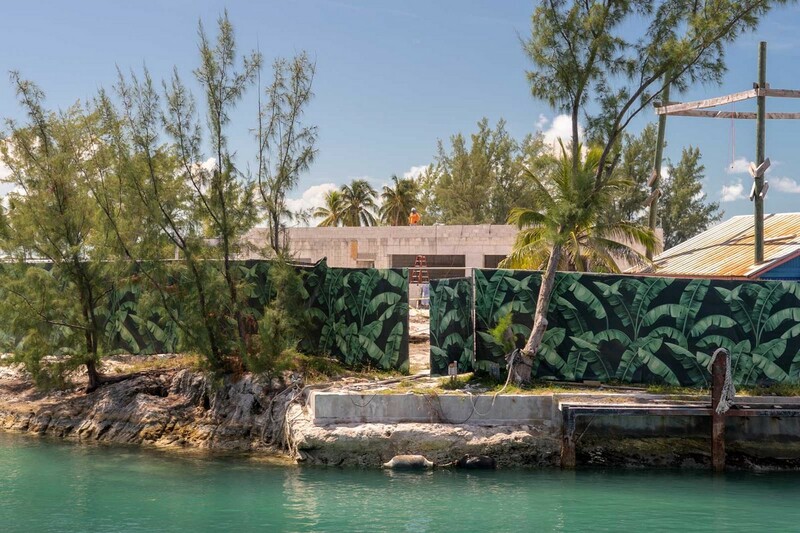 Royal Caribbean has updated its website with a new timeline for when different phases of its transformation of private island CocoCay. 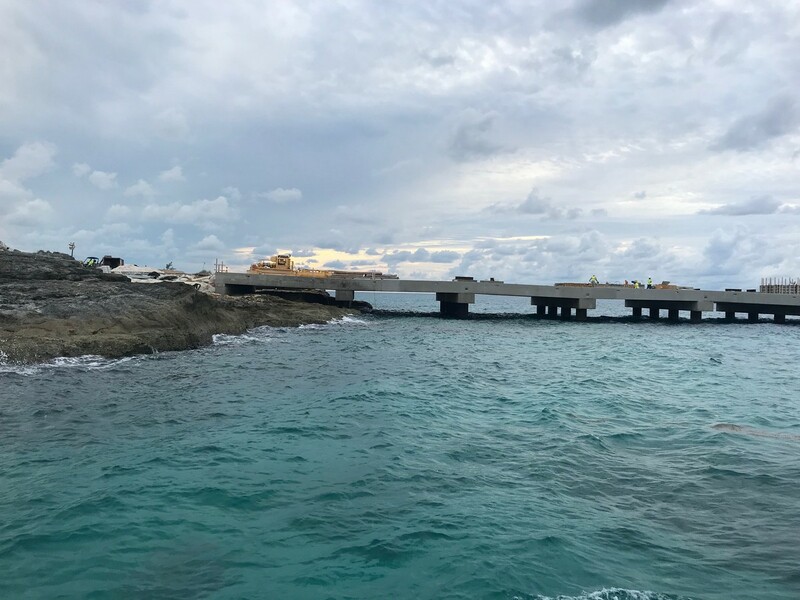 The new pier will begin welcoming guests to the island in March 2019. 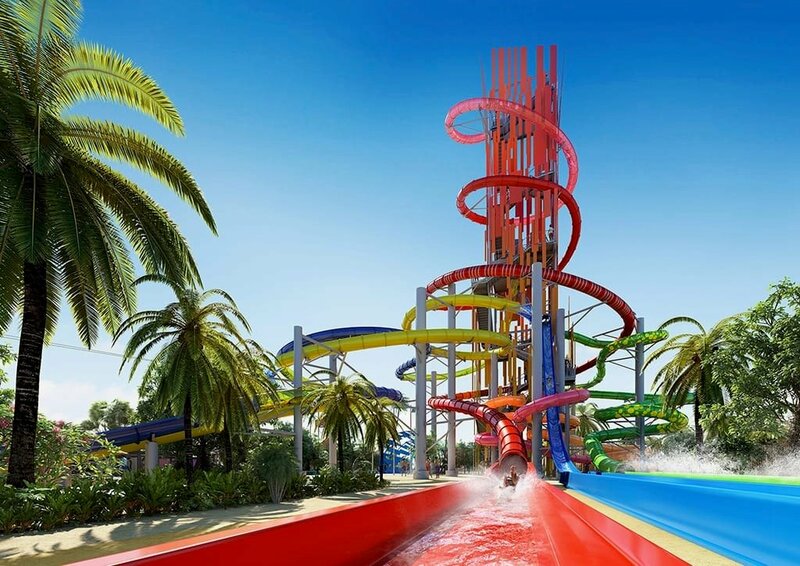 Thrill Waterpark, the Zip Line, Splashaway Bay aqua park, Up, Up and Away helium balloon, Captain Jack’s Galleon, Skipper’s Grill dining, Captain Jack’s dining, Chill Island, Chill Grill dining, and Oasis Lagoon freshwater pool will open in May 2019. 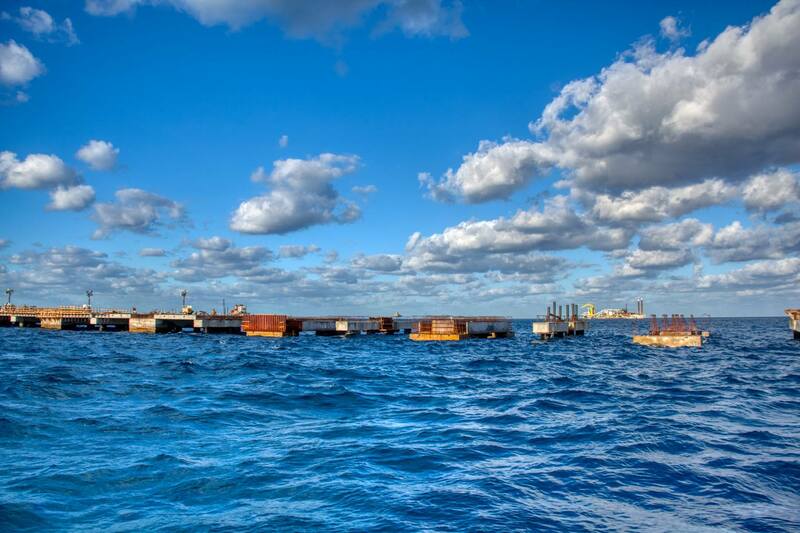 The primary change in the timeline is the pier completion date has been pushed back yet again. 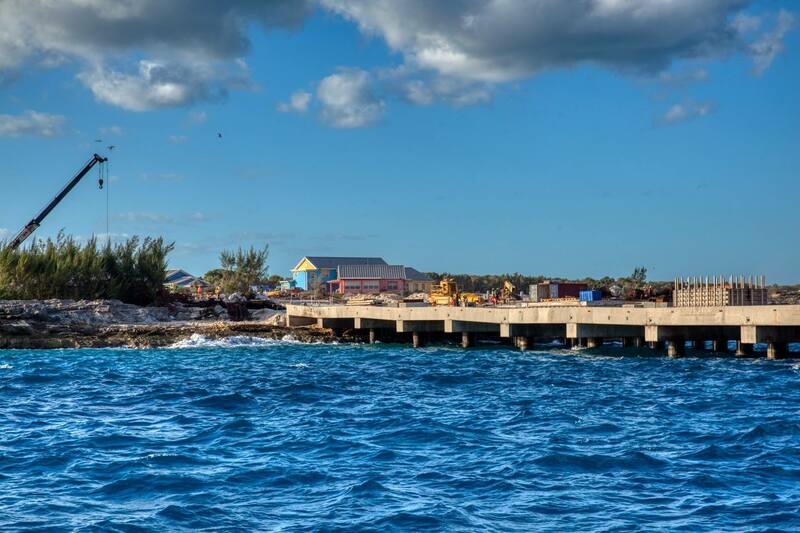 The pier completion date has slid a few times since the project was originally announced. 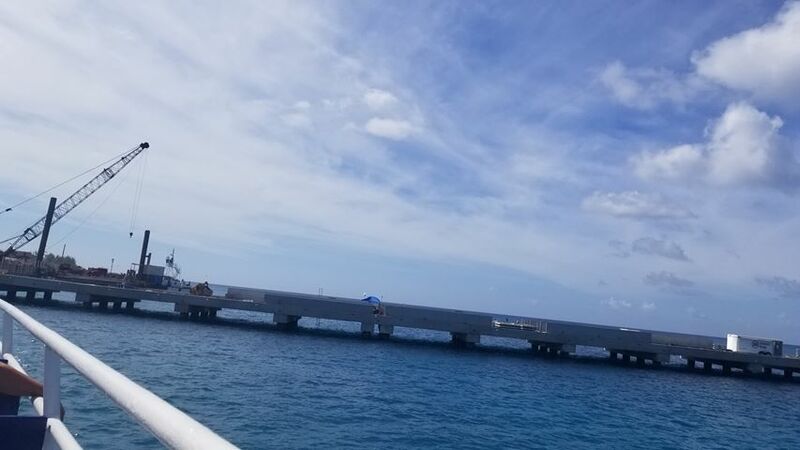 Prior to today, it was expected that the pier would be complete in January 2019. The other dates remain unchanged. 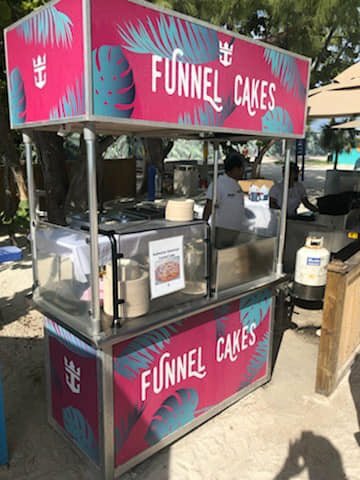 As you stroll down the beach at Royal Caribbean's private island of CocoCay, you might find yourself craving a funnel cake (naturally!). 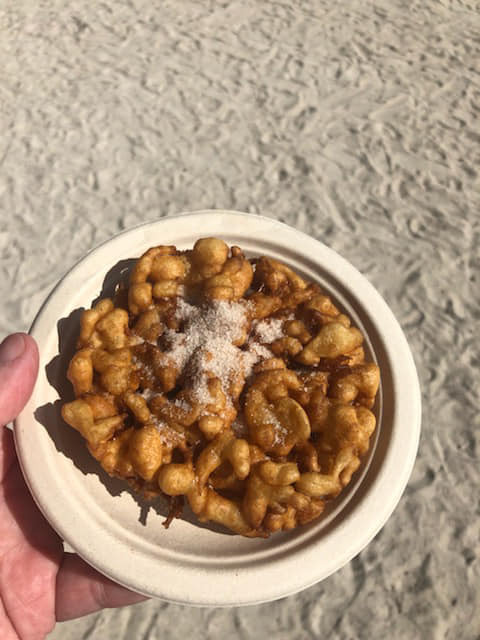 When that happens you’ll want to stop by the new funnel cake kiosk. 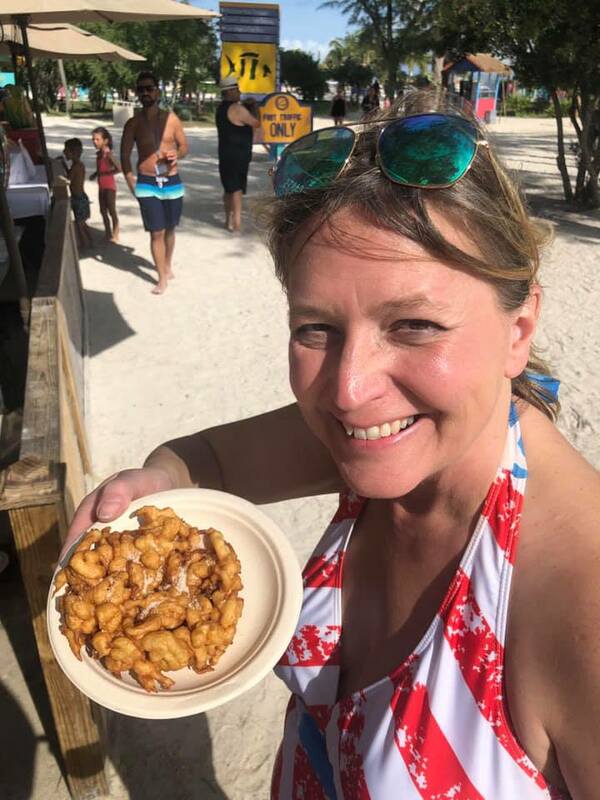 Royal Caribbean Blog reader Lauralee Best spotted (and sampled) the funnel cakes while visiting CocoCay this past weekend on an Enchantment of the Seas cruise. The best part about them (other than the sugar on top) is that there is no additional cost to enjoy one of these treats. 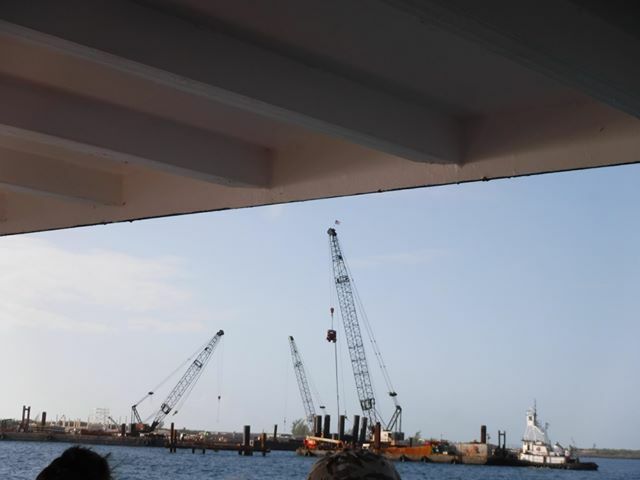 It is included with your cruise fare. 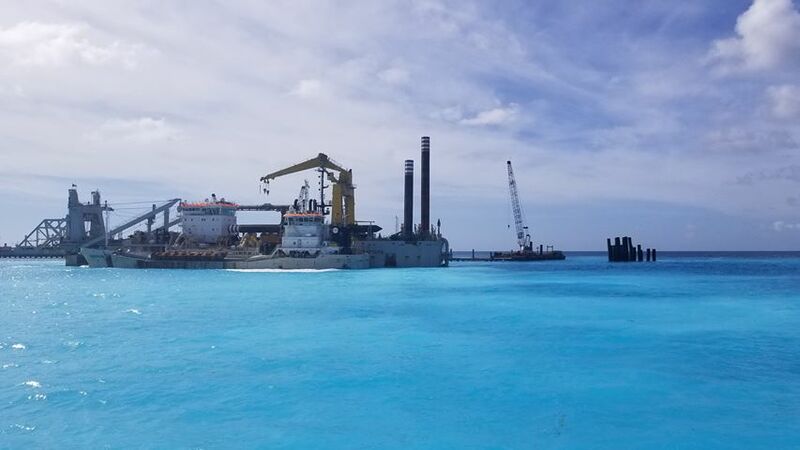 Dredging boats were spotted at Royal Caribbean's private destination of CocoCay in the Bahamas, signaling the start of a pivotal milestone in creating a pier for ships to dock. 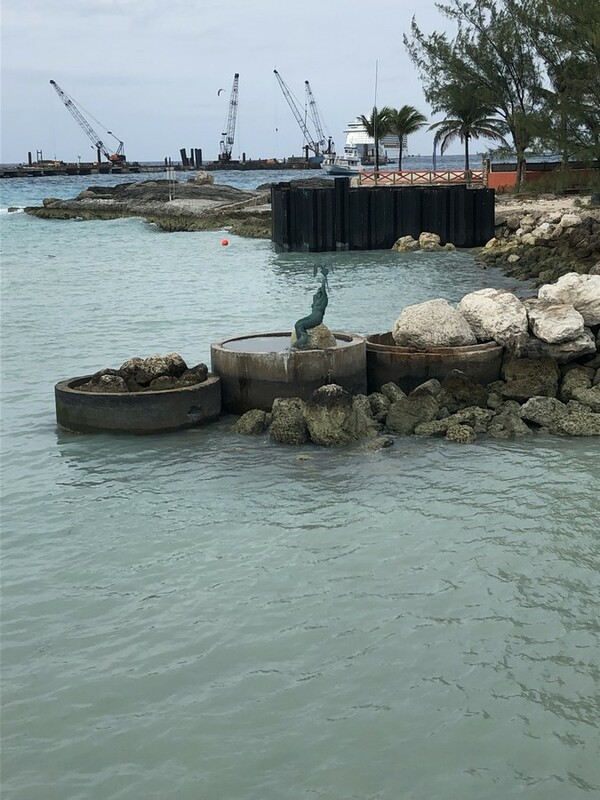 Majesty of the Seas visited CocoCay this past weekend, and dredging vessels were onhand to indicate work had begun recently. 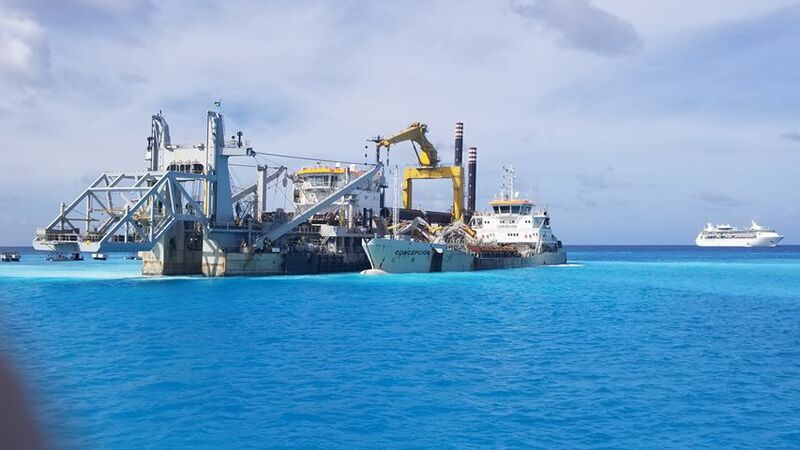 Dredging is a form of excavation carried out underwater to provide a waterway for cruise ships to access the pier that is under construction. 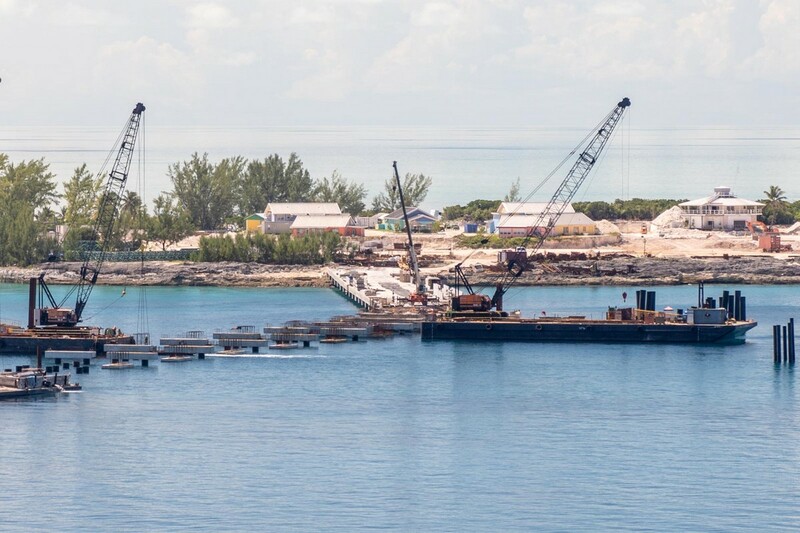 Once the new pier and dredging are complete, Royal Caribbean's cruise ships can visit CocoCay by docking instead of tendering. 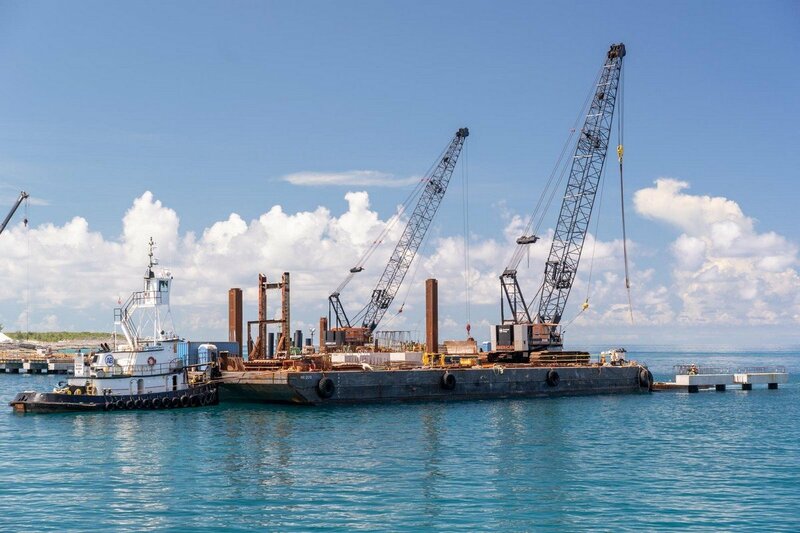 Royal Caribbean International CEO Michael Bayley estimates out of all the sailings to CocoCay, about 10 or 11% would be missed due to unfavorable tendering conditions. 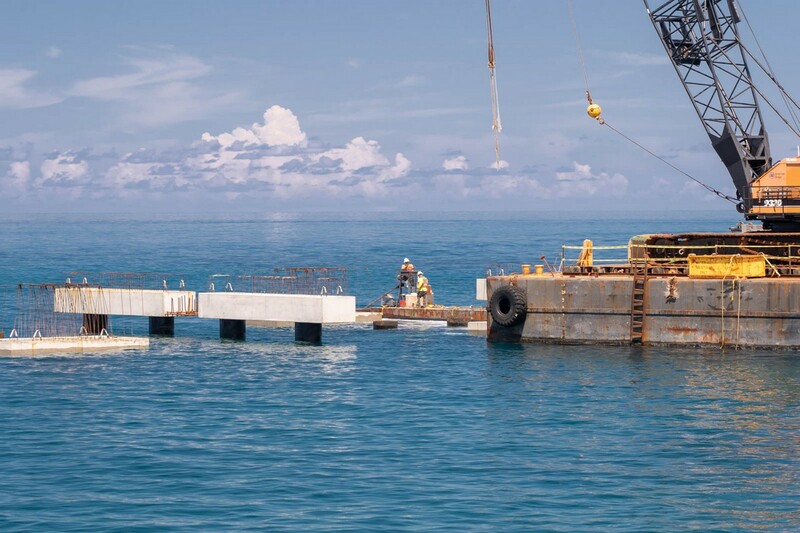 With the new pier, he believes the missed calls will drop to about 2%. 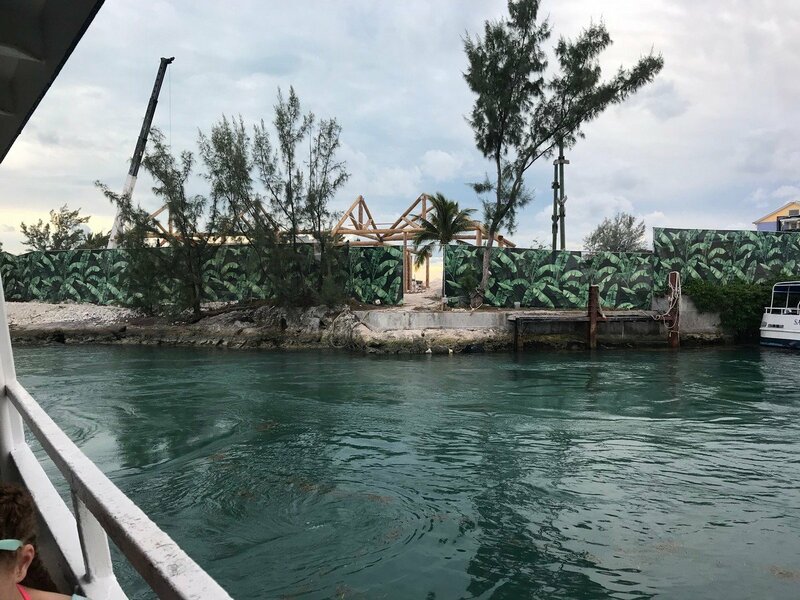 Royal Caribbean is hard at work to transform its private island of CocoCay in the Bahamas to Perfect Day at CocoCay, and we have a look at the progress that has been made recently. 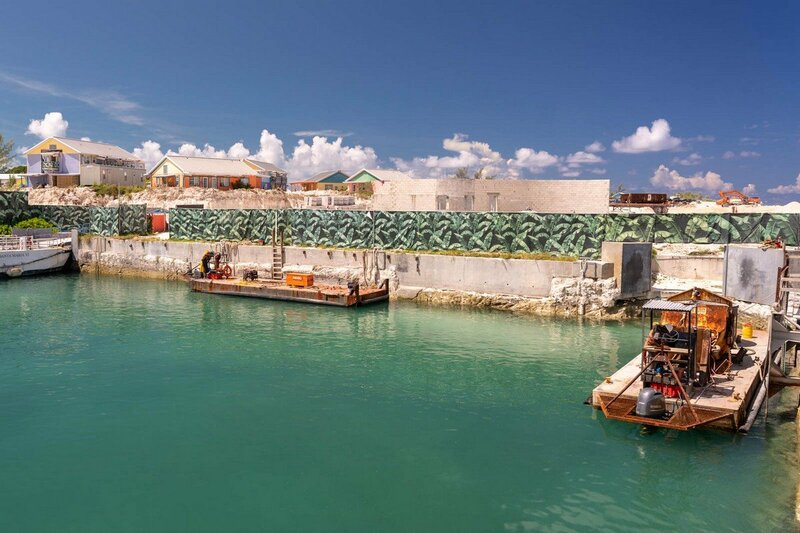 Royal Caribbean Blog readers Brian and Elizabeth Robison visited CocoCay while on Mariner of the Seas and provided these photos. 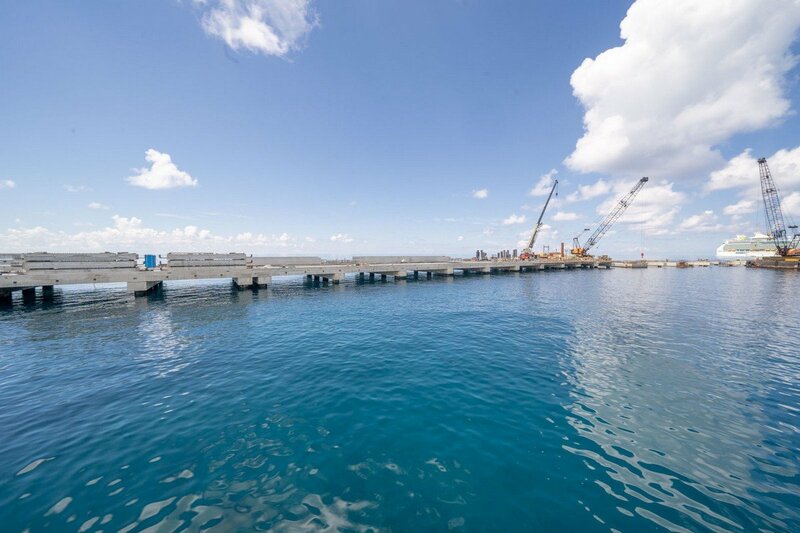 The new pier is expected to open around the end of this year. 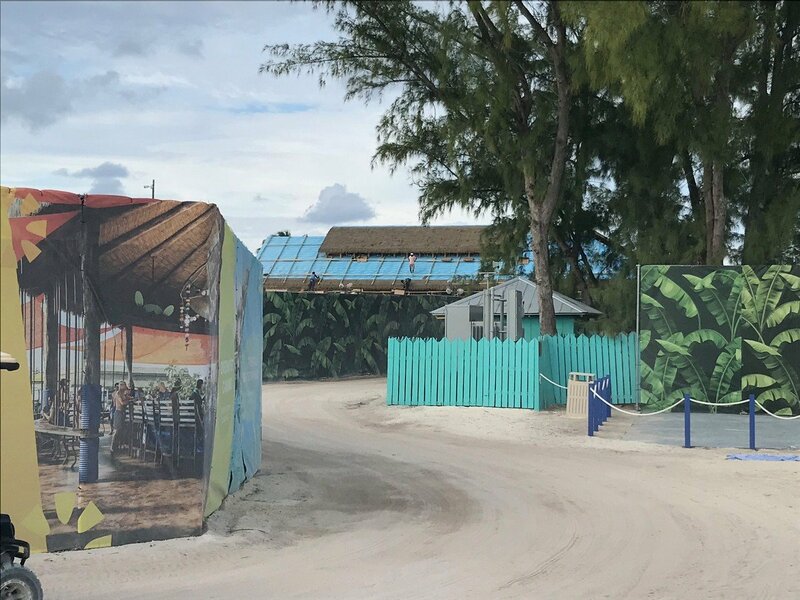 Royal Caribbean has informed its travel partners that the Navigator of the Seas May 3, 2019 sailing is targeted as the first ship to experience private destination Perfect Day at CocoCay. 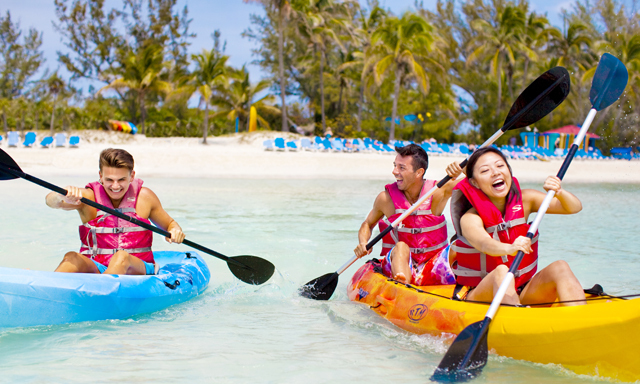 Navigator of the Seas will sail a 3 night Bahamas sailing between May 3-6, 2019. 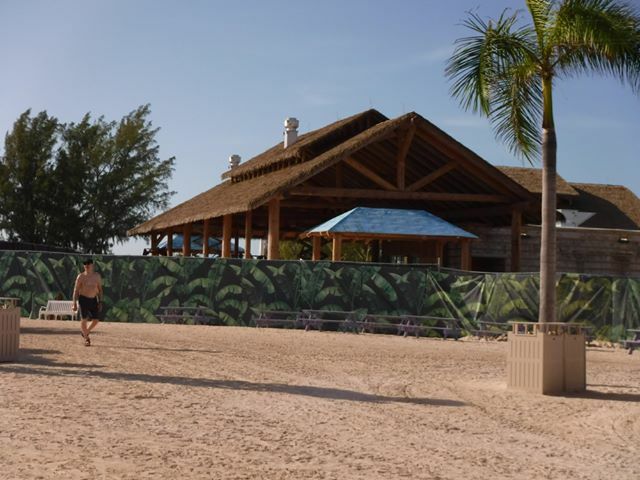 Perfect Day at CocoCay is a $200 million makeover of Royal Caribbean's private destination in the Bahamas. 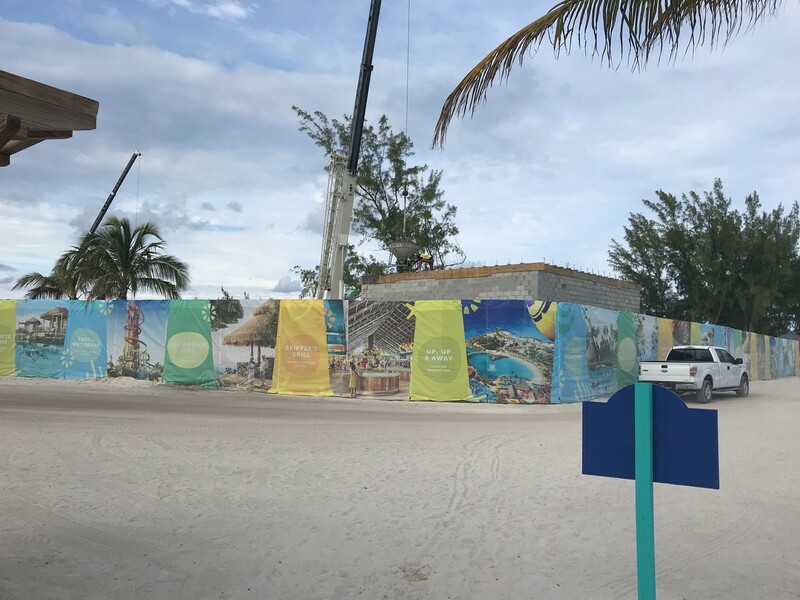 CocoCay will offer guests plenty of ways to relax and enjoy beautiful beaches and pristine water, plus thrilling experiences like Thrill Water Park, ziplining and water sports. 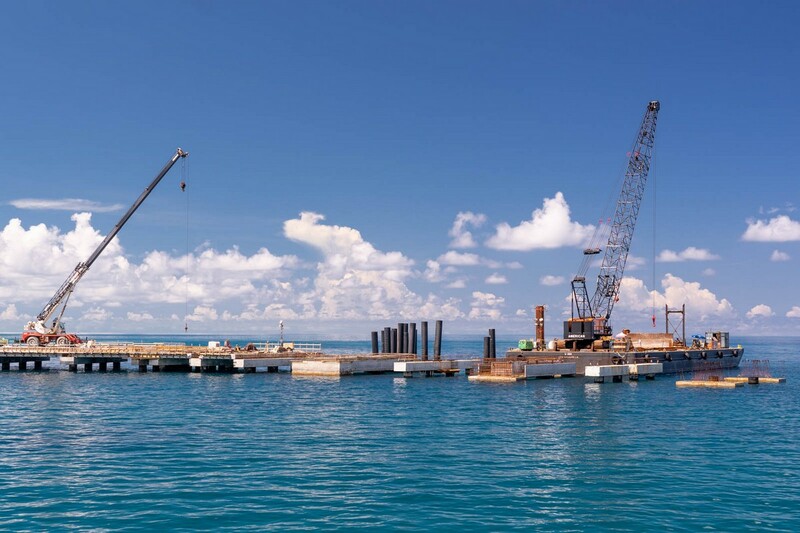 According to Royal Caribbean's website, Thrill Waterpark, the Zip Line, Splashaway Bay aqua park, Up, Up and Away helium balloon, Captain Jack’s Galleon, Skipper’s Grill dining, Captain Jack’s dining, Chill Island, Chill Grill dining, and Oasis Lagoon freshwater pool will open in May 2019. 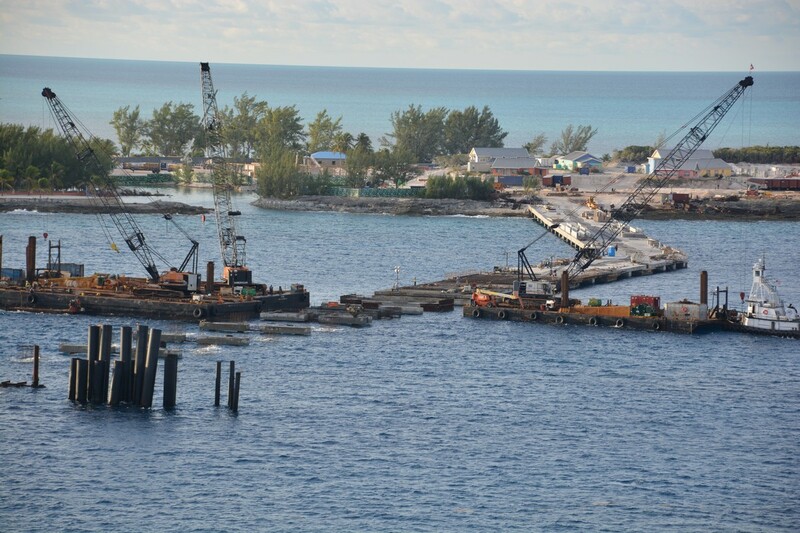 Royal Caribbean Blog reader Twangster visited CocoCay while on Mariner of the Seas and provided these photos. 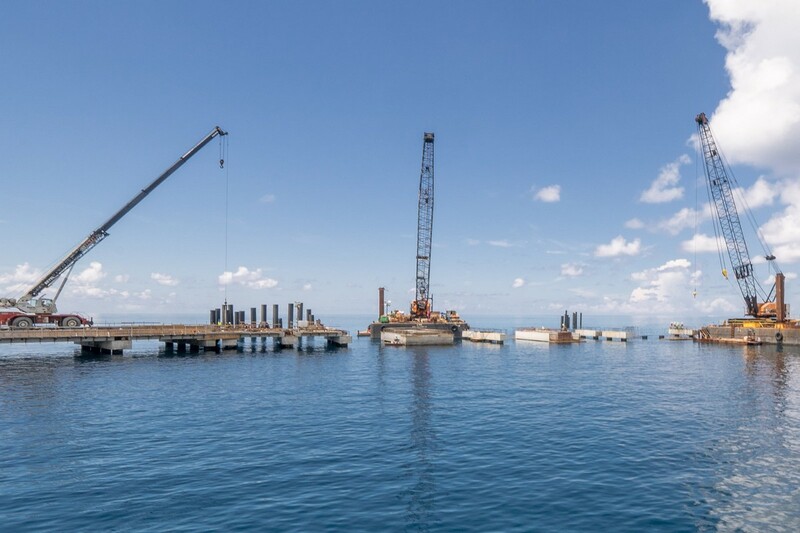 We start with a look at the progress being made on the new pier. 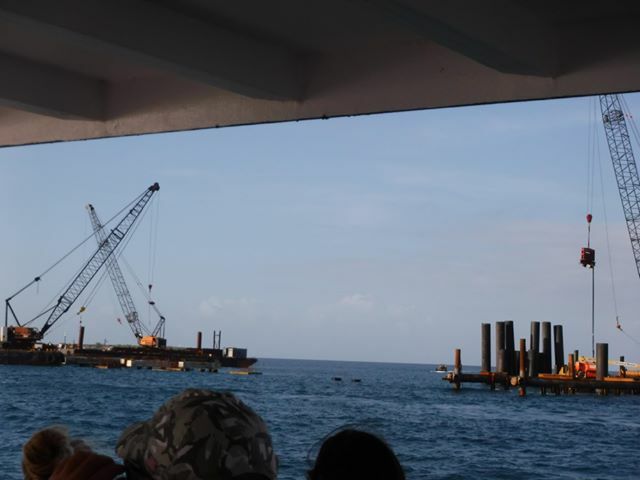 Once you get up close, as seen from the tender from ship to shore, the flurry of work activity becomes more apparent. 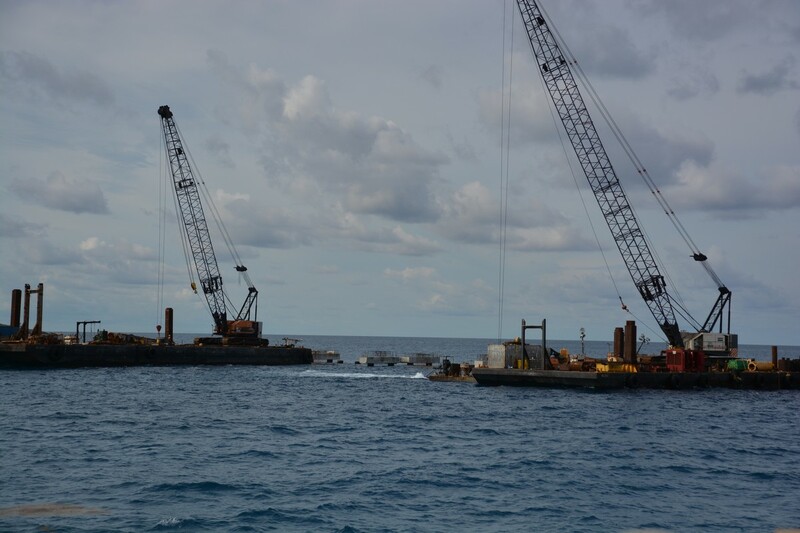 Up close you can see the foundation work that has advanced over the past six weeks. 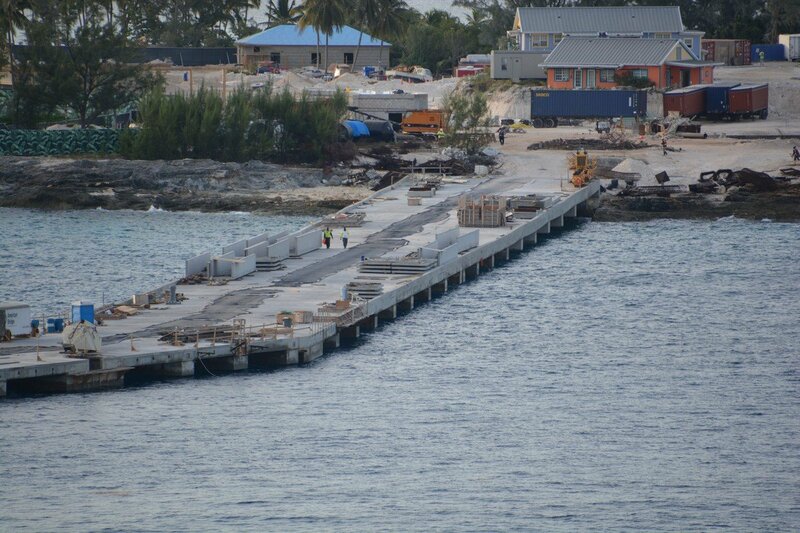 The support beams for the next phase of the pier have been staged on the recently completed section of the pier. 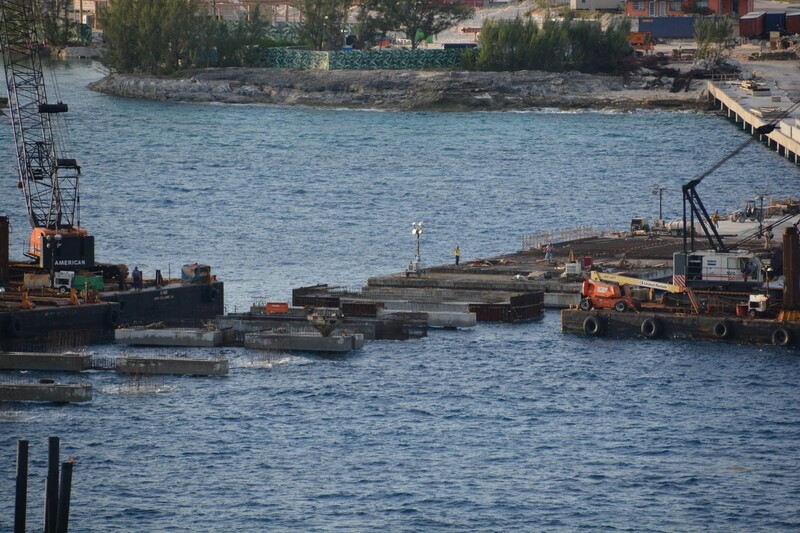 Work across the harbor where the tenders currently dock is also continuing with new buildings continuing to rise up. 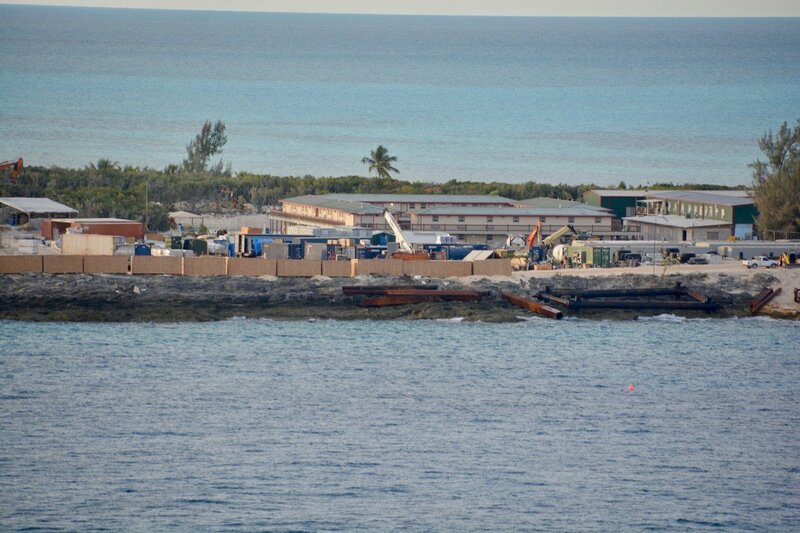 This area is not far from where the pier will deliver guests onto CocoCay when they first arrive. 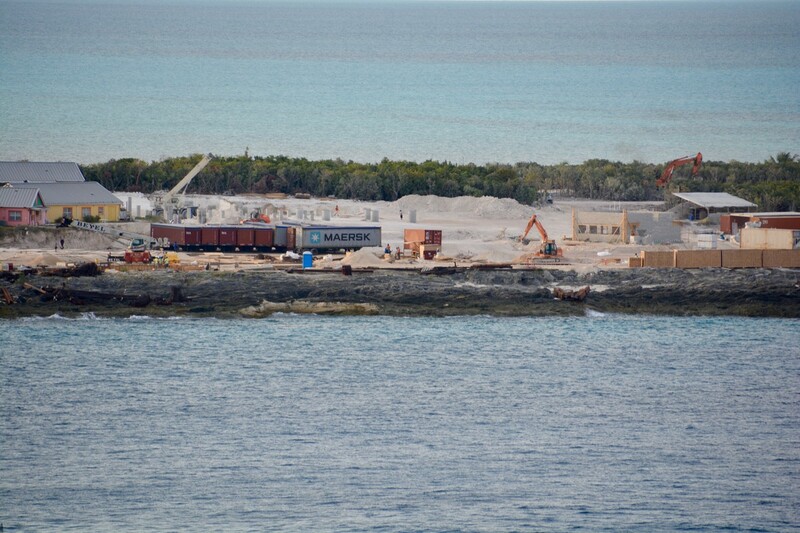 Some of the construction activity can be spotted on a point of land well past the current location of the beach bungalows.